The average working adult is no stranger to paying bills. Whether it be a car payment, mortgage, or monthly subscription to your favorite magazine; they are not going to pay themselves. Luckily, many people usually only have their own bills to worry about. But imagine not only having to pay your bills, but the bills of an association, as well. As the accounts payable clerk for an association management company, paying multiple invoices is something I deal with on a daily basis. Here are a few tips that I have discovered useful when paying invoices. Throughout the year, an association may have multiple meetings and events. It is for this reason that categorically organizing your invoices is particularly important. Arranging unpaid invoices alphabetically is a great way to do this. This will allow you to search for specific invoices in an easy-to-find way. This is also an efficient way to see how many invoices still have not arrived. Many times, the association manager will provide a list of vendors whose invoices I should expect within the next month; it is typically a list of around five to ten. From this, I can compare the number of invoices I have already received with the number of invoices I should be expecting. If it does not add up, I inform the manager and they will then contact the supplier to remind them. The unpaid invoice usually arrives a short time later. On every invoice, there is a period from when the invoice was created to when it needs to be paid. This is called the payment term. For instance, you could see such terms as Due Upon Receipt, Net 15 or Net 30. That is, the balance must be paid immediately or within 15 or 30 days. 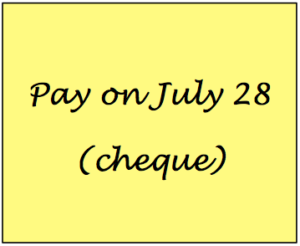 It is important to highlight both the payment term and due date. This increases the likelihood that the payment is never past due. One of my favourite and most efficient ways to stay organized when paying invoices is using post-it notes. When invoices have a clear due date, provided by the payment term, I attach a post-it note onto it with the date it needs to be paid by. It is imperative to ensure never to write the exact due date on it, but rather a couple days before it is due. This creates a safety window should an unexpected circumstance arise that prevents the bill from being paid on the day that it is due. I then arrange all the invoices in order in which they need to be paid, starting with the soonest. To make sure that invoices are being billed to the appropriate meeting or event, the adoption of purchase order books is a systematic way to remain organized. That is, whenever a purchase is made within the office, a purchase order (PO) slip is written, which includes the title of the meeting or event, vendor/supplier being used, item/service purchased, date of purchase, approximate cost, method of payment, and the purchaser’s (staff member) initials. The staff member would then provide the PO number at the time of purchase. With this, I can effectively match up the PO number indicated on the invoice when it shows up on my desk with the PO slip. I now have all the information I need to ensure that the invoice is being coded towards the correct meeting or event. If invoices are not being paid on time, associations could be subject to potential late fees ranging from 15% to 18% of the invoice total. To save both time and money, I must make sure to stay organized. It is essential to maintain a clean record for the association and by using these tips, paying their invoices on time is never a problem.